You must make reservations at least 5 minutes in advance of the time at Happy Talk. 16 COLD BEERS ON TAP! Full Dinner Menu available at 3pm! Full NFL on big screens. We always enjoy Happy Talk! The food was great, the service was great! Parking is so-so because of lack of space. We suggest valet parking, it’s really the only option. We thought that the decor has declined a bit in the last couple of years, small details need attention..that said this space is rented as I understand it from the Hanalei Bay Resort. I recognize it’s difficult to maintain an open air space on Kauai. We definitely recommend Happy Talk, a casual dining experience for an enjoyable pub style menu and ice cold beer! Beautiful view and really great food and service! The food was great. But the service was terrible. No one came back to ask for refills or clear our table. Also, in my reservation they asked (and I selected) a standard table because we had two seniors and several short people with us. I also noted that we ALL were celebrating birthdays and could we have a view. We ended up at a high table that was a high edge slab and difficult to sit and eat at. It was also at the column... so no view. Overall, a big disappointment. So if you have more than four people...take a pass on Happy Talk. Loved hearing the Hawaiian and mixed music but they only played until 9pm! The Loco Moco was yummy and the Ahi Poke Bowl were outstanding! Thanks for another awesome dinner at Happy Talk! Food and table service were excellent! Accommodations were correctly made for one gluten free diner. The only negative was being locked out of the bathroom and having to go back and get a key from our server. Tasty food. Great outdoor setup. Love was music was great. Maybe a little loud but we were sitting close by. Would recommend to friends for sure! Beautiful atmosphere, great happy hour specials and very tasty pupus (appetizers). Highly recommend the coconut shrimp, ceviche, ribs and pulled pork quesadilla . . . all were amazing!! We always enjoy going to Happy Talk. Easy. Good Music. Good food. And now that valet parking is available again, we go more often. Great live music, beautiful sunsets, awesome service, food and drinks! We loved it! If you like sports bars with LOTS of big screens (as in, all in a row around the whole restaurant), then this might be your place. If you like sports-bar type food (unpretentious, simple, and not fancy or particularly refined, but still quality and fresh-tasting), then this might be your place.... 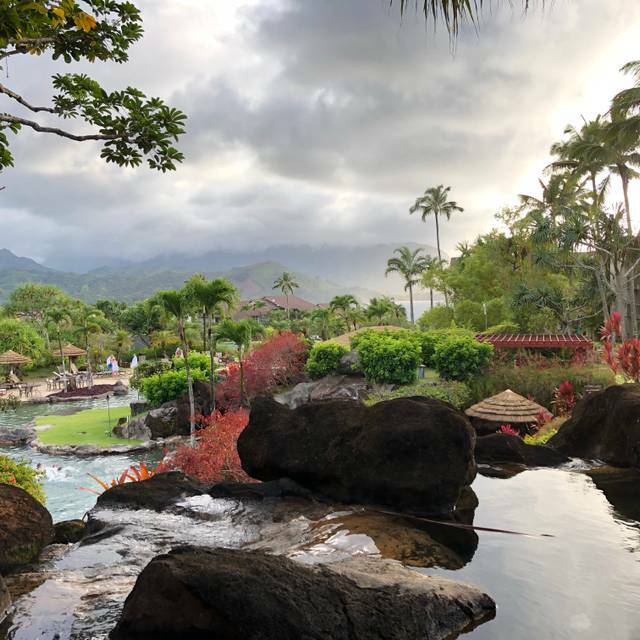 The view over the jungle ravine to Hanalei Bay and the mountains is amazing, and the servers are friendly and efficient. There’s even not-too-loud live music.... Just don’t go expecting this beautifully located sports bar to be more than it is.... If you want to soak up the view with as little screen distraction as possible, ask to be seated close to the edge of the garden.... Would we go back? Yes, probably, requesting a table close to the garden’s edge. Overpriced drinks. Horrible queso cheese. It was my birthday and very disappointed. Unfriendly service. Great spot!! The live music was excellent and not too loud that you couldn’t talk. Service was great along with the food. Beautiful setting. A must visit. Hostess and server were great, as was the ambiance, cocktails, and band. The food, however, was really disappointing for the price. Bar food, and not even good bar food. We are not fussy, demanding eaters. I ordered the coconut shrimp combo ($25); the salad greens were limp and warm, the rice was stone cold and the shrimp were overcooked. Husband had the burger ($20), which was meh. Fries were stubs like at the bottom of the bag. Won't be back. The food quality did not seem to match the prices. And the 20% forced gratuity was a shock. 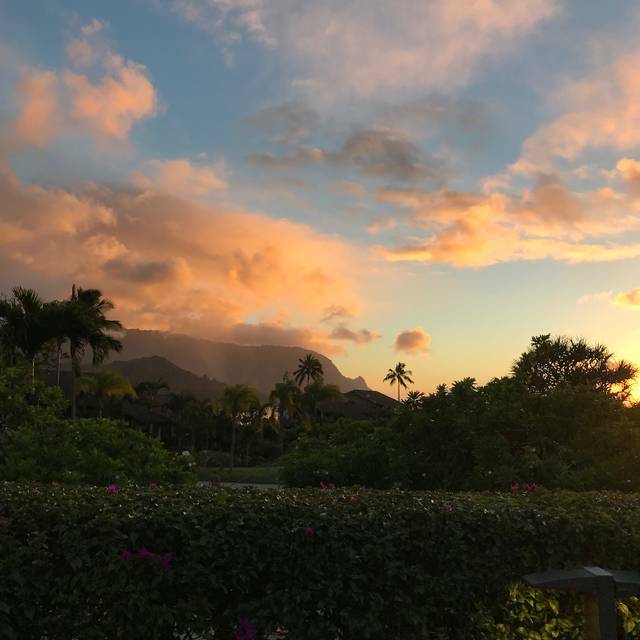 There are better values with better food on Kauai. We love this restaurant, especially since they instituted valet parking. We have been coming here for a few years and it is one of our favorites. My only recommendatin is to expand the menu to include more fresh fish options (eg shrimp scampi, butterfish, almond crusted salmon, seafood medley. etc) and more pasta dishes. Service was exceptional. 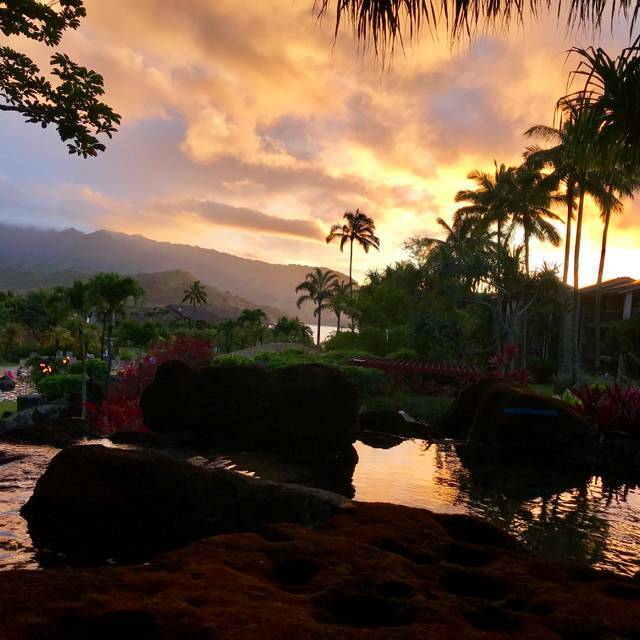 View is the best in Princeville! Food is excellent and service is spot on. My favorite! The overall experience was great. Very casual and relaxing. The view was spectacular. 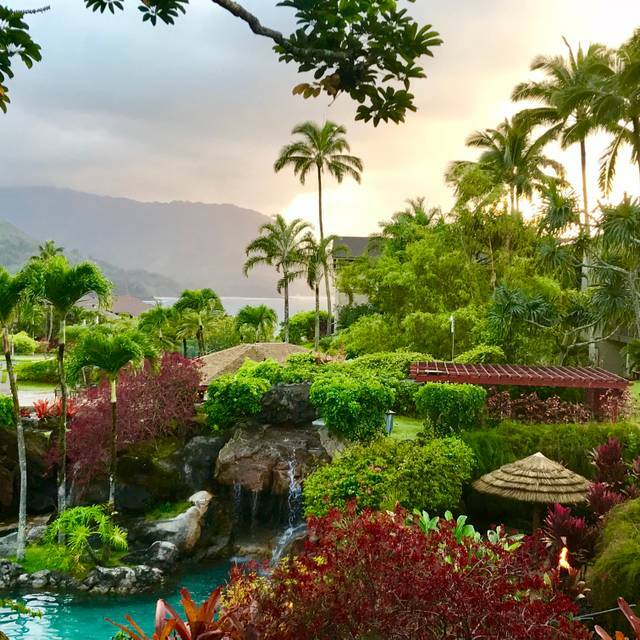 During our stay in Princeville, Kauai, our group of 4 (2 couples) enjoyed many restaurants. Happy Talk was certainly one of the best! It was so good, in fact that we ate dinner there twice and stopped in another day for drinks and snacks during Happy Hour. 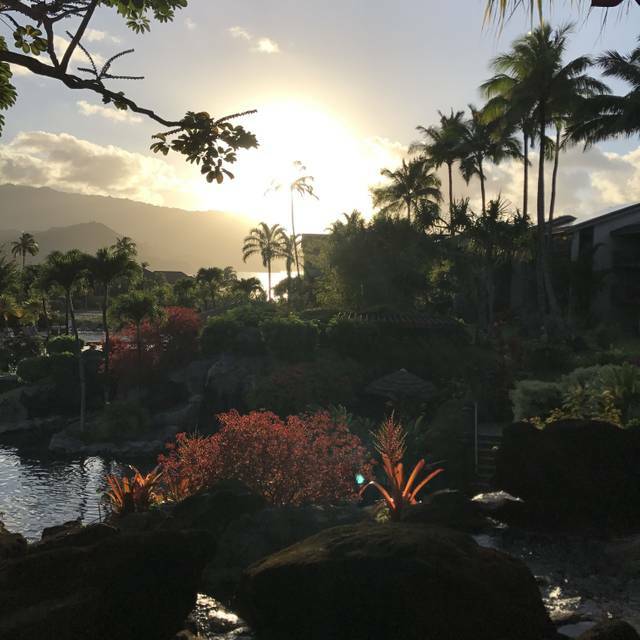 The food was excellent, the entertainment was superb and the view is one of the most beautiful in Kauai. During eac dinner there was live music by some very unusual and talented duos . They played a wide variety of music and really connected with the customers. Happy Talk is in an obviously popular and busy condo/hotel so do't be bashful about using the valet parking. 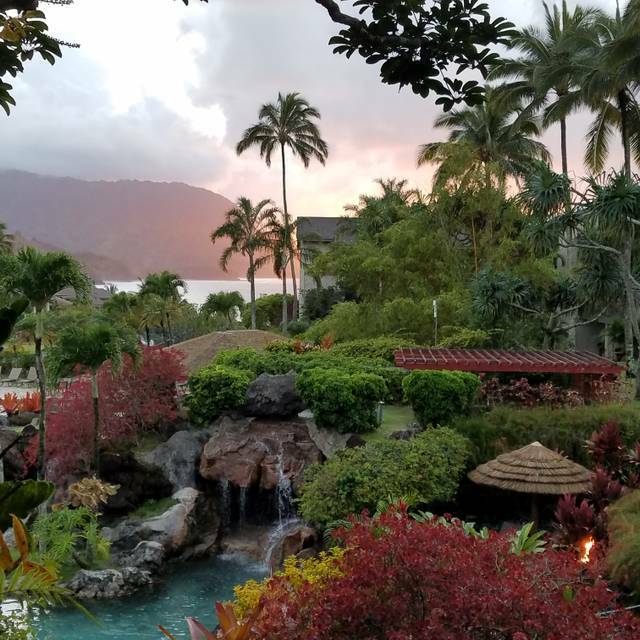 If you arrive early, take the elevator in the looby down one floor and see the beautiful pool, again with a fantastic view of Hanalei and the Pacific. If you are looking for a place for quiet conversation this is not it. For a great party and delicious food this is #1! Very disappointing. Food was so so. Music too loud to talk. Chickens stealing food off table. Little boy at table next to us had his grilled cheese stolen out of his hand by a chicken. Can’t recommend. OMG! What a wonderful, fun, enjoyable experience! Just had the most wonderful coconut shrimp dinner and watched a beautiful sunset into the ocean. Service by Tom was excellent. Food was outstanding. Live music was totally enjoyable. We will be back! 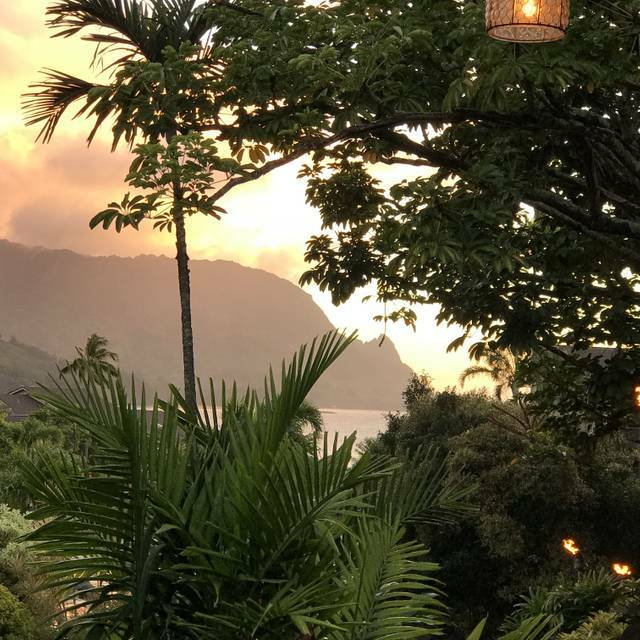 Best dining view on Kauai! Happy hour daily 3-5 pm got our attention! The setting is stunning and the food/service was awesome! The band was local and very good! Been come to Princeville for over 20 years and this is the best!! Don’t miss it! Happy Talk is a great restaurant and bar with live music. We always enjoy our time there. Found this gem online while we were staying in Princeville. It was a perfect place to relax, enjoy the scenery, and have great food and cocktails. The music was not overwhelming, but very entertaining. 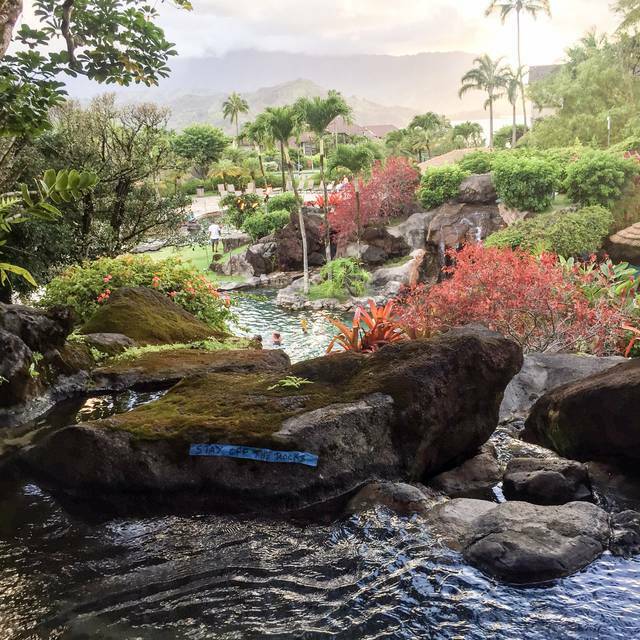 Absolutely best place in Kauai. Most beautiful view, great creative local food, great entertainment. ESP enjoyed Falling Romance on Monday. Actual photo from our table. Looks like a post card. Superior view ! We ate here three times during our stay. All of our food was pretty good. Ribs were very good. 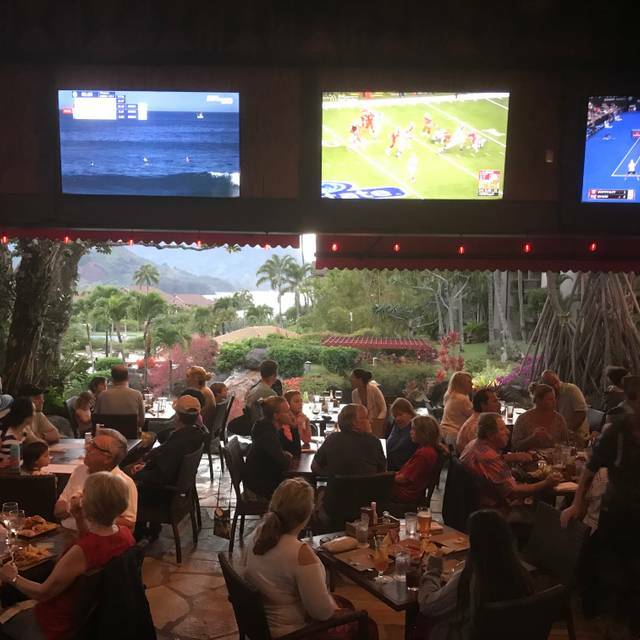 Numerous TVs and live music every night. Only open 5-9. That is bummer because that is basically your only choice for food. We had some fantastic servers and a few pretty good ones. Menu is limited but view is worth it. Good food, cold beer, delicious mixed drinks, and wonderful atmosphere. Tends to be a little pricey but on par for what you would expect to pay on the island. We love the happy talk for a casual meal with a great view. There is often live music too. Go at sunset! This is a combo of a sports bar, restaurant, dance place. There was a live band that was a little too loud for any dinner convo. Tv's everywhere. Good service, good food, large portions for a good price. The ribs and mashed potatoes were delicious, BLT was huge and yummy, garden/spring rolls were huge and fresh. It could be a romantic spot if you sat ouside away from the band. Lively & fun atmosphere. Live music is good, be prepared to talk over it.